WOW! 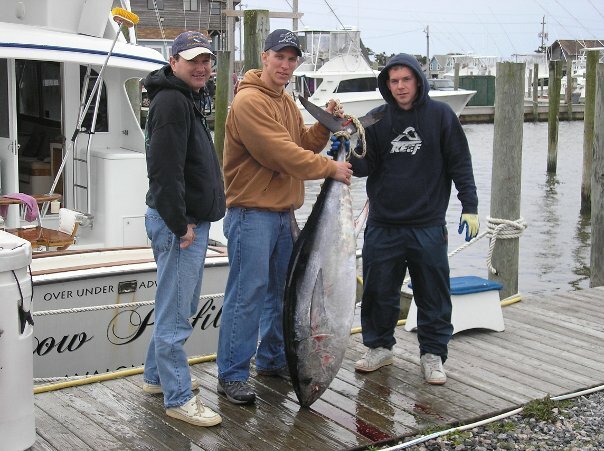 What a great day to kick-off our spring season Fishing Hatteras, Excellent bluefin fishing for the entire fleet. Pulled out of Village Marina at 6:50 made a short 24 mile run to the fishing grounds, as we got closer we could see the birds and the steam coming off the water. Capt Darrin pulled back as soon as we crossed the 30 degree break I heard him yell down "They're here". Before I could ever pin up the first long rigger, it was ripped out of my hand, the other long rigger still paying out, with the clicker on, started to speed up. Eased the drag up, and it was game! Double header! This continued for the rest of the day, never going more than 10 minutes without a bite. All of our fish were in the 60-69 inch range but the highlightwas releasing a 90"+ fish estimated at a touch over 400. By 1pm our guys had all they could handle each catching 3 fish per person. Talking to some local friends who had a blast with Jigging gear said they had ll the could handle also. Well tomorrow is our next day on the water, hopefully i'll be able to give you another excellent report. Pictures soon to follow.